The welcome party takes place in the „Nürnberger Stuben“ at the Maritim Hotel Nuremberg as from the late afternoon. You can join the party freely, as it is contained in the registration fee. 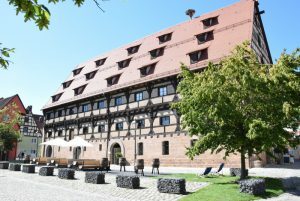 The Hospitality Evening takes place at the “Kornhaus” of the “HopfenBierGut” in Spalt near Nuremberg. After a fundamental renovation, the world of hops and beer can be experienced at the HopfenBierGut on 1200 qm. The more than 550-year-old house, designed interactively and modern, is now a unique experience of hops and beer culture – for every visitor! Interactive productions bring the world of hops and brewing into life. Whether experiencing, tasting or being astonished – here you are right in the middle of it all. Tour Guides will be available for any questions about the location, history of the building and the museum. Participation in the hospitality event is included in your registration. Coming soon.